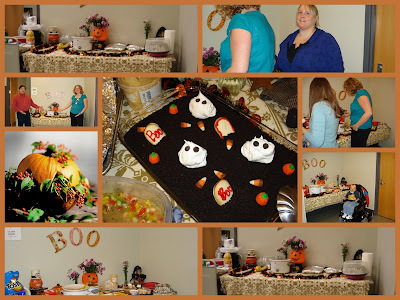 A few pictures from our carry-in yesterday...great food, and lots of fun! Ghosts in the Graveyard are in the center frame...cute AND delicious. Looks delicious and quite fun. See you tomorrow at Bunco! Someone, You(??? ), did a wonderful job pulling this all together. It's always great to have a person like yourself who knows how to put on a feast or an event.